The length of each side of the net is 60cm (appx). (for rabbit, puppy, guinea, and other small animals). Trixie Joy Hamster Run Play Pen This hamster and mouse enclosure is ideal for indoor use. It offers your small pet enough space for moving and playing, without any risk of nibbling at furniture, cable or any other objects. This enclosure can be assembled and dismantled easily. It can also be extended with further enclosures. The bars are varnished in a variety of colours. Offers the pet the necessary freedom For indoor use Extendable (buy 2 or even 3 and just clip them together for a bigger Indoor Run Item No. 6247 8 Sides, all approx 34 cm x 23 cm Bar spacing approx 1 cm approx size when set up as in picture is 32" x 32" Pets Must Be Supervised. Trixie 6257 nylon floor for free-wheeling enclosure, black. Marke Trixie. This nylon floor fits to the cages for small animals and is easy to fasten with velcro on the enclosure. The page length is 6 x 60 cm. 4.5M Steel Wire Dog leash with dog stake with ground screw pet stake anchor Pet fitted stake accessories. 360 rotation for dog leash, for dog less than 80kg. the largest. Dog Leash: Steel Wire material, specification: 0.5cm 450cm. ITEM#: 17392925Protect your chickens from predators and provide them plenty of room to nest and sleep with this chicken coop duplex. This coop has two sleeping and two nesting areas, and a front and back door so you can easily reach your birds. You must remove collars and harnesses from your pet before putting into the pen. Free roof net and indoor base. Galvanised 6 piece hexagonal pet run. Item model number: EB-6360X6A. Can be used indoors or outdoors. Fully breathable protective cover easy to fit in seconds. Now your pet can play what ever the weather. Item model number: HC-48"RUN. This superb cage combines a run with our most popular size of rabbit cage! Colours will vary from picture. Box Contains A high quality Little Friends Product. colours will vary from picture. Indoor rabbit 100 cage with run: ideal for rabbits & guinea pigs. Habau Runddach Maxi round-roofed pen for small pets with built-in run for rodentsThe Runddach Maxi pen for small pets is designed to be a double pen, suitable for keeping two rodents separate. Two removable zinc-plated cleaning panels have been inserted. Ellie-Bo Galvanised Rabbit/ Guinea Pig/ Duck/ Chicken Enclosure Run with Roof/ Sunshade, 119 x 74 x 6 cm. Galvanised rectangular run with two doors, one on the roof and one on the side, in addition there is a drop door on each side of the run. Trixie natura nylon base for indoor and outdoor use. Prevents the floor becoming soiled. Prevents the pet against wet floors outside. Prevents the pets burrowing out. Fast and easy to fix due to velcro. Constructed from weatherproof glazed pine. Wooden and wire outdoor small animal run with removable hood. 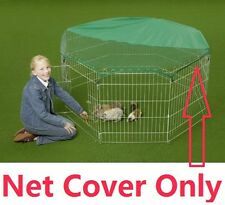 All over cover prevents the pet jumping out and gives protection against birds of prey and cats. You must remove collars and harnesses from your pet before putting into the pen. Free roof net and indoor base. Galvanised 6 piece hexagonal pet run. Item model number: EB-6360X6B. Can be used indoors or outdoors. For indoor use. Ideal for mice and hamster. For indoor use. Date First Available: 17 Jan. 2008. Item model number: 6247. Quantity: 1.